It took me a little bit of time to get going today but eventually I did get stuff done. 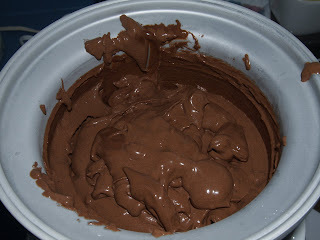 I decided to use the chocolate ice cream recipe that came with the ice cream maker. I had to cook a portion of it then let it chill until it was good and cold. So, I whipped it up and then chilled it. While chilling, it was the perfect day to take the boys to the pool. I poured the mix in, watched it spin, and spin, and spin. I know.. the old saying popped in my head – A watched pot never boils. Sigh, with my head dropped, I left the kitchen and left the little machine to do its thing. First check in was at 10 minutes, nope nothing. Second check was at 15 minutes, *rats* still nothing. Third check was at 25 minutes, whoa! we have nice thick ice cream. Turn off machine, take off lid, pull out paddle, insert spoon (I just need a tiny taste), and instantly fall in love with the new creation. 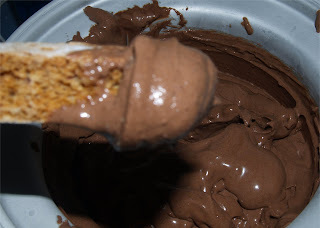 Mmm.. so creamy, full of chocolate flavor, not sweet, and absolutely out of this world. This piece of almond biscotti was just calling to be dunked into the ice cream. mmm..itwasawonderfulcombination... you did not see it here though.